← Midship seating and sail plan redesign. During the building of Alice Gale I have spent time working out how I wanted the deck to be finished. For a long time I thought I would be making a wood finish, most likely mahogany striping from my wood left overs. 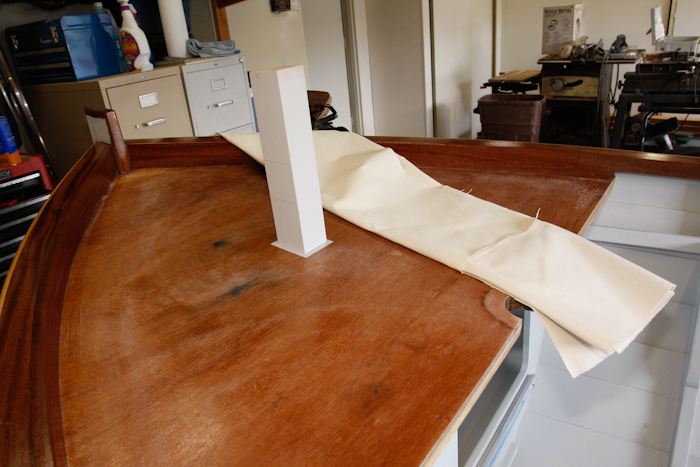 While reviewing classical boat construction I learned about the use of canvas covering over the deck beams. 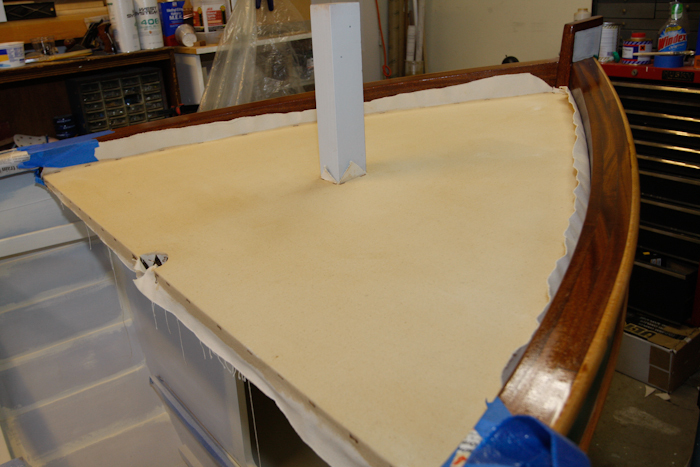 A modification of this process for plywood decking using wood glue as a substrate sealer caught my attention. I really liked the idea of a classical look to the deck and appreciate the rougher non slip finish. An alternative solution that would look quite similar and much more durable would have been a Dynel cloth and epoxy finish. 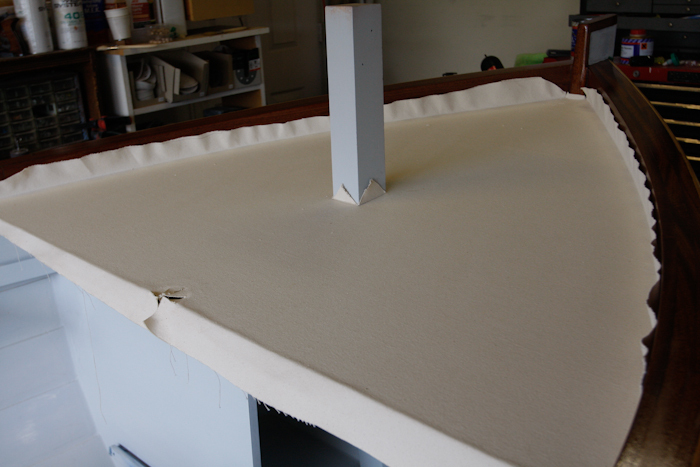 The WoodenBoat Forum has a lot of references on both Dynel and canvas covering. 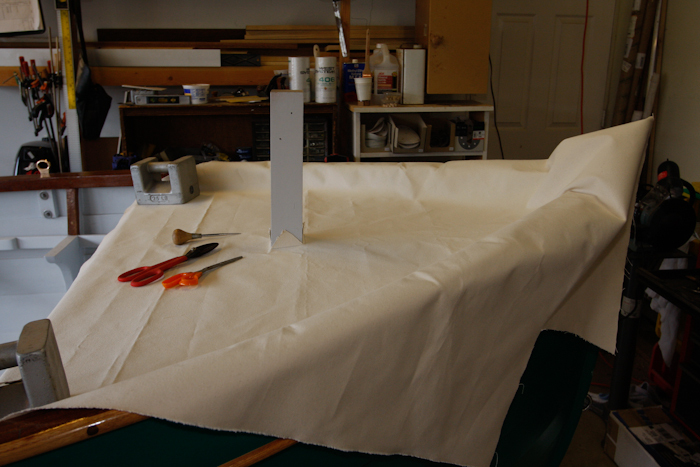 I decided on the canvas covering option primarily due to the simplicity of application. 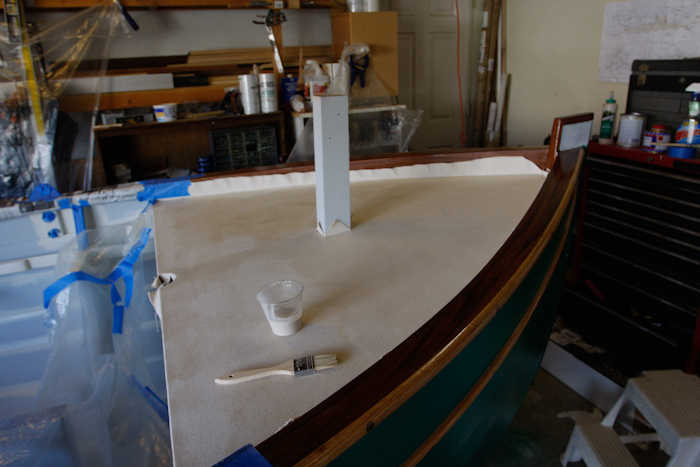 The canvas is glued to the plywood deck with Titebond III wood glue. 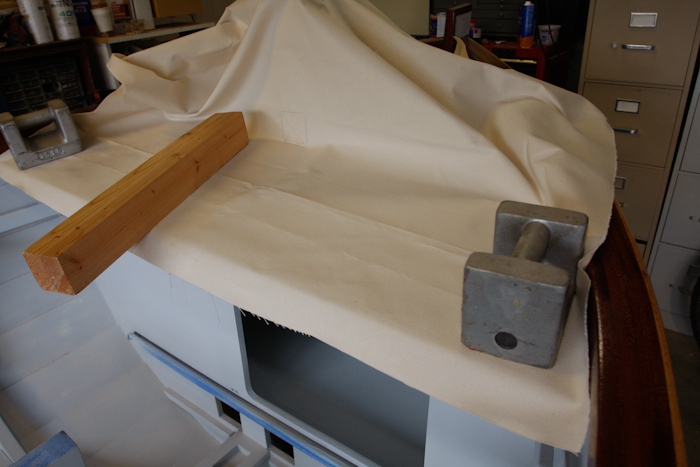 A generous amount of glue is spread evenly onto the plywood and a scrapper is used to push out any wrinkles. I started from the center bitt and worked outward to the gunwale. 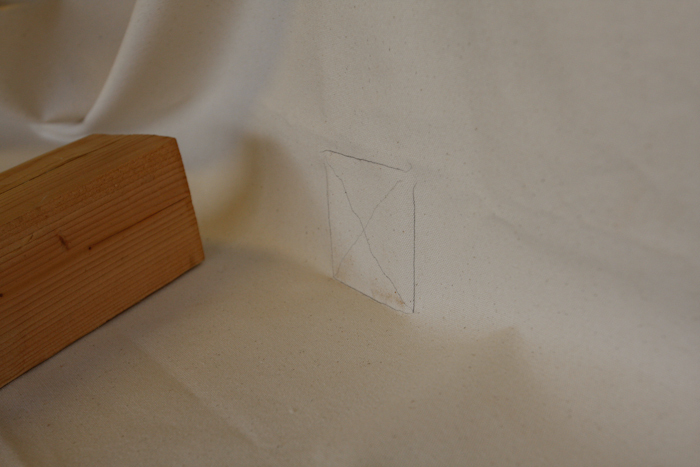 The edges are then stapled. After allowing the glue to dry overnight the entire decking is sealed with a mixture of Titebond glue diluted with 30% water. 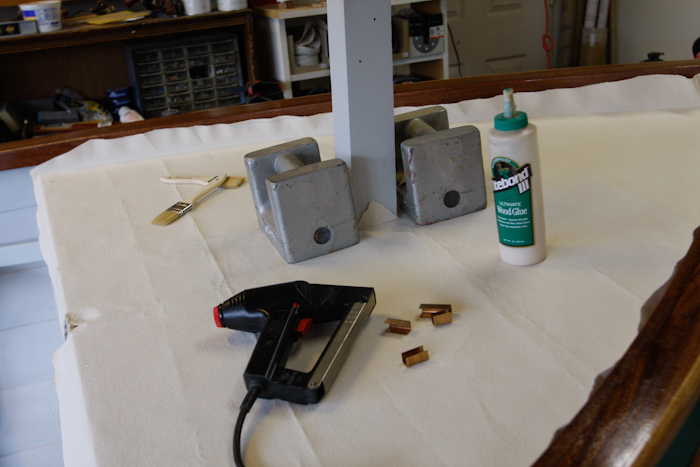 But first use a spray bottle of water and a household cloth iron to reactivate the glue and stretch out the canvas. 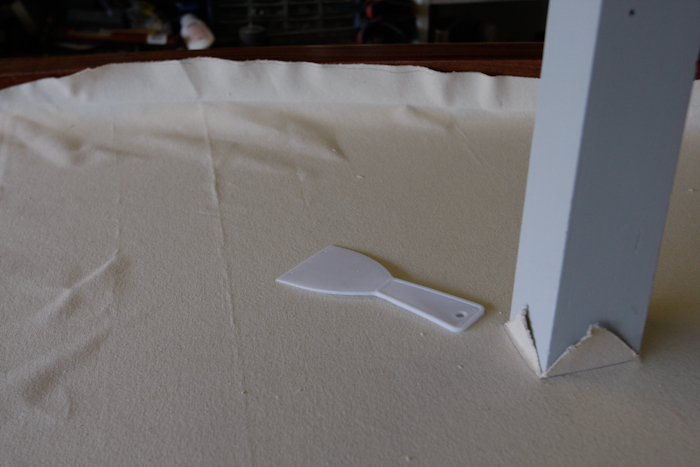 The diluted glue is then painted on until the canvas is saturated throughout with the glue mixture. Glue has set and ready for paint. Thanks for the posting. I will soon have to do some canvas over wood and did not have a clue how to find it. Thanks so much. Cherokee a 1924 Consolidated. Thats an all round amazingly written piece! The white canvas deck on my sailboat is quite stained. It has been in a barn uncovered for 25 years. I plan on giving it a coat of paint after I have given it a good cleaning and let it bleach out. Do you plan on using the sys3 paint full strength or will you delute it in order to maintain the rough surface of the canvas? Hi Howard. I have painted several coats of LPU System 3 paint onto the canvas so far. I think I thinned a modest amount each time. I understand I can paint it as thick or as often as I want or need to until I have covered the natural rough surface of the canvas. Eventually I would then have to add a non slip additive between coats. You may also want to research you options on which paint to use. The recommendations range and you will have to make your owned informed decision. My choices may not be the best options, but for various reasons I make them. I had enough LPU left over from painting the interior and at $146.00 a gallon, I didn’t want to waste what was left. Fascinating! I will be sad when the project is done but glad to get to go for a sail. Makes a lot of sense choosing the water-based LPU from Sys 3 for the canvas. This looks like a fun way to do it, a nice break from epoxy. Stan, when is your anticipated launch? There will be other Vivier launches in coming years, a customer MT is building a Beg-Meil, an Ebihen 16 in Maine, another Ebihen 16 in Minnesota just delivered as a kit. Clint, I am looking forward to seeing other US based constructions for Francois Vivier boat designs. I think the availability of CNC kits from your company will make building much easier. If the builders have a web site or blog I would love keep in touch with them. My anticipated launch is not set for any particular date but I hope to see water within the next few months. 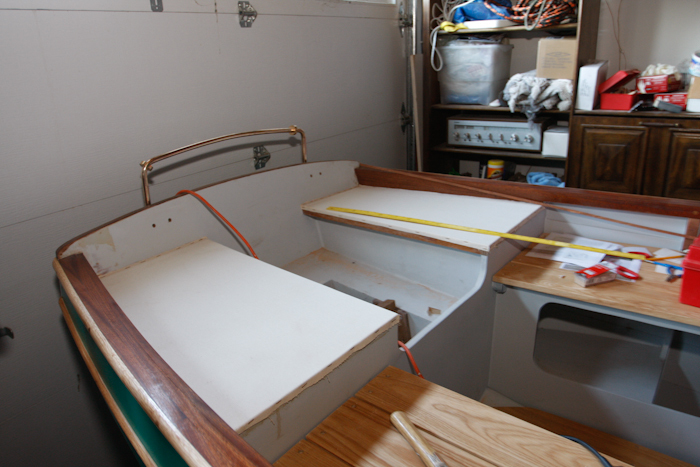 I am finishing trim and hardware installation on the boat now, but still need to build the spars, shape the centerboard, and finish the rudder. I can appreciate the no-slip need on a boat and the canvas ought to do the trick. It was great visiting last week and seeing your great work in person. 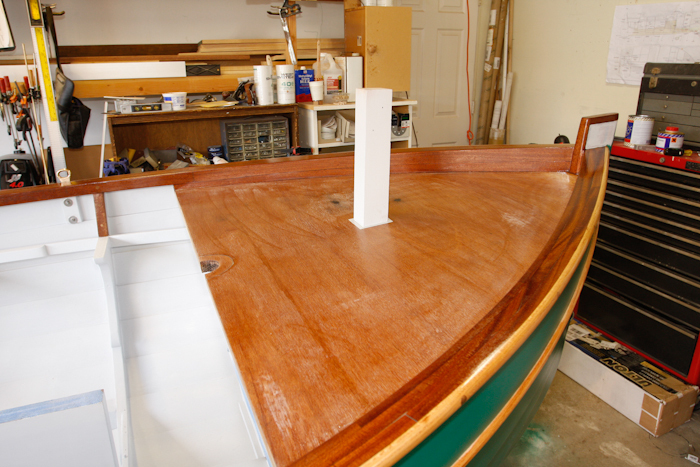 Your boat is such a work of beauty…smooth curves and outstanding craftsmanship. Thanks Jamie, Each part of building ‘Alice Gale’ has been educational. I decided to canvas the deck as much for the learning experience as for the quality look I hope for. I really like the idea of canvas over the deck areas. With such a traditional looking design this is a great look. Where did you pick up the canvas material. I may go for this myself. Using the Titebond is also a plus in my book after all the epoxy glop normally involved in such a build. 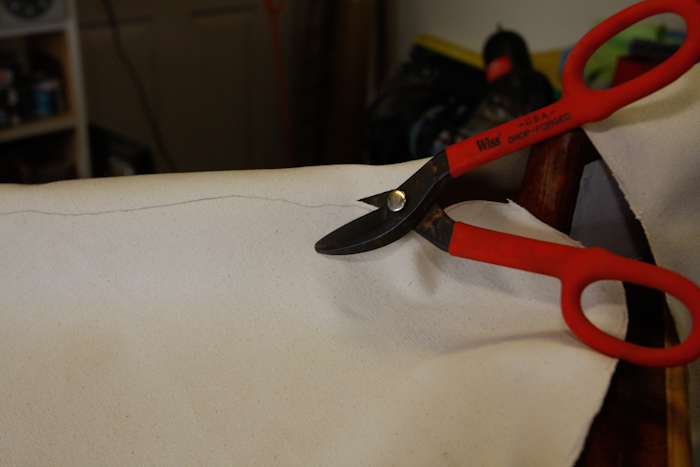 I purchased my canvas from Seattle Fabrics.